Ah. Real Food. This is what January was meant to be. Not including the peanut M&Ms (which I mistakenly bought a XXL bag of because I was hungry at Costco….never a good thing) the food around here has most definitely taken a turn for the more wholesome. I can’t really promise that this will last long, but while I’m craving healthy food, I might as well take advantage. There is nothing quite like a warm, hearty, filling and yet healthy stew to warm up with on chilly January evening. Or considering the 40-50 degree days we have been having I should probably say, “On a abnormally warm, almost balmy January evening in Ohio”, but it just doesn’t have the same ring. Global warming is seriously ruining seasonal eating. 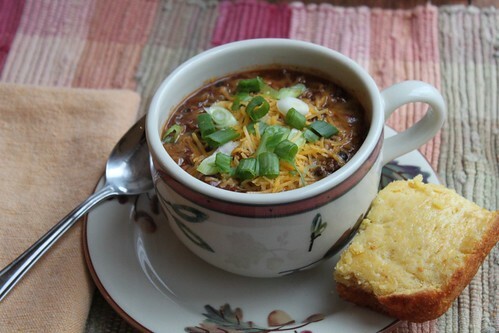 No matter what the weather, I could probably eat this stew. Well I might be lying slightly. I wouldn’t eat it in the summer. That would be like some kind of sin- hot stew in the summer? 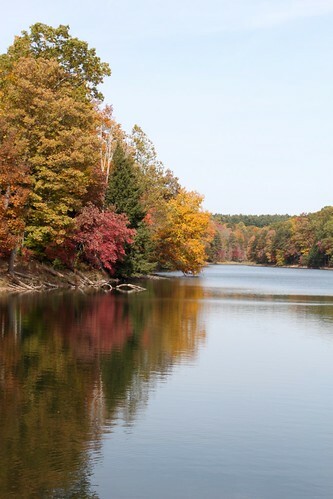 But anytime September through April would be fine if you are lucky enough to live in a place like tropical Toledo. (Can you sense my bitterness at winter – and this is even after I got an automatic car starter for Christmas!). But in all seriousness, the first time I made this stew was back in Louisiana, where the humidity never drops below 100% – and it was still good. It’s the kind of stew that feels well balanced because you get vegetables, grain, and protein all in one place. 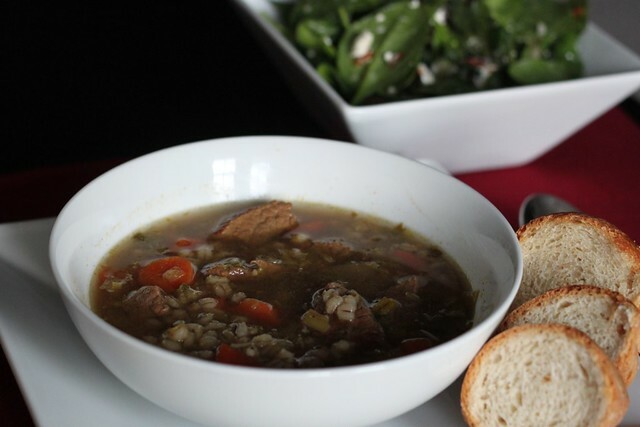 I really love the addition of barley because it makes this stew seem extra hearty and yet also somewhat gourmet. One caution is that the barley continues to absorb water after cooking. When you go to get leftovers the next day you may find that all the liquid is gone and the barley has doubled in size – but never fear – just add a bit more water, and reheat. 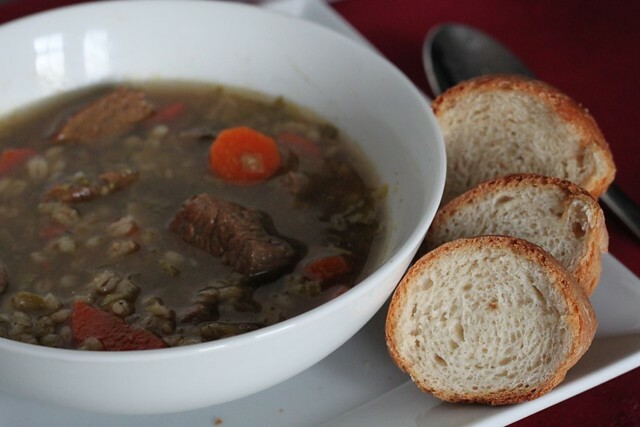 If you are trying to make this in advance, or if you’d like to freeze it, I would probably make it without the barley, and then just add the barley when reheating it. 1. Heat a large Dutch oven over medium-high heat. Coat pan with cooking spray. 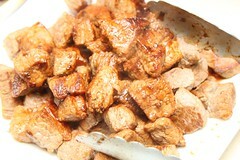 Add half of beef; cook 5 minutes, browning on all sides. Remove from pan. Repeat procedure with remaining beef. 2. Heat oil in pan over medium-high heat. 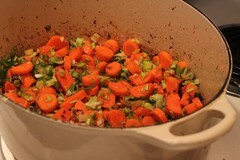 Add leek, carrot, and garlic; sauté 4 minutes or until lightly browned. Return beef to pan. Add all ingredients EXCEPT barley and bring to a boil. Cover, reduce heat, and simmer 1 hour, or longer if desired. Add barley; cook 30 minutes or until beef and barley are tender. Discard bay leaves. A couple weeks ago, I thought the soup making weather for the year was over – clearly I was wrong. 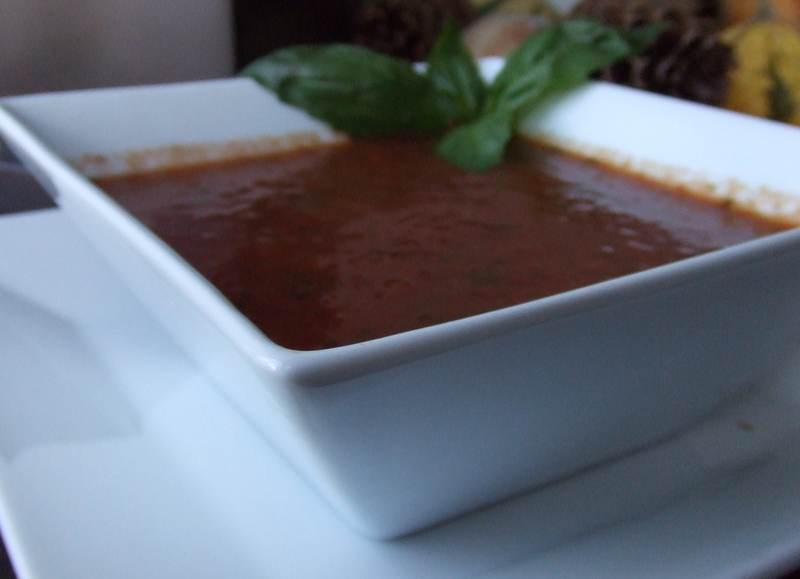 I guess a good way to embrace the cold, is to look at it as one last opportunity to make a warm wintery soup! 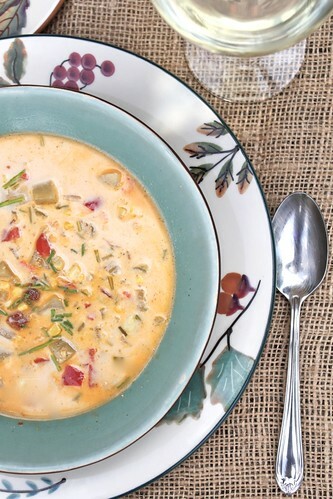 When I was planning the grocery/menu list this week, I asked John what soup he would want for a (fingers crossed) last soup of winter meal, secretly hoping he would pick this soup. Without any coaching from me, he said, “How about the potato one you make?”, so that sealed the deal – it went on the menu. It also happens to be a quick meal (chopping is the only kitchen time), and a one pot deal (less clean up)! 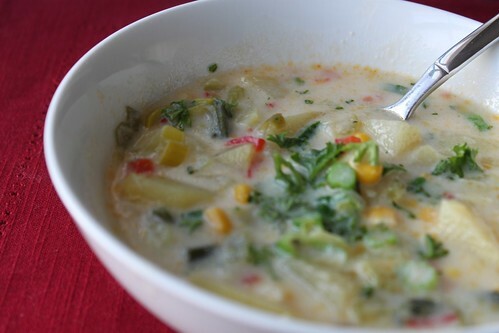 What I like about this soup is that it’s a potato soup, with more than just potatoes and cream. It has has a lot of vegetables in it, so it really feels like a balanced meal. It does use some whole milk, but just enough to give it that creamy texture, while still keeping it healthy and relatively low fat. I do realize that just before this I posted a recipe primarily made of butter and sugar – but what can I say, I like my sweets sinful and my meals, well the opposite. 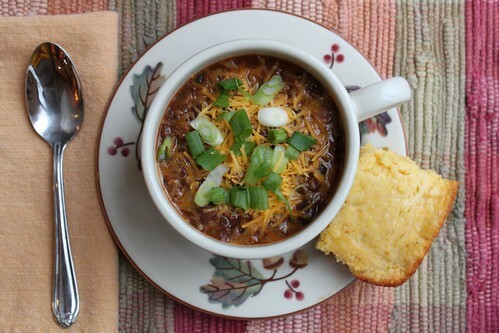 This soup is pretty filling, and this recipe makes a lot – so if you’re not feeding a crowd, you might want to try halving it. However, this is one of the few meals where I think the leftovers actually taste just as good or better than the original meal. This is a rare finding for me, so I don’t mind making the whole thing and eating it later in the week. I’ve never tried freezing it, but if you try it – let me know how it turns out! Melt butter in a large dutch oven over medium heat. 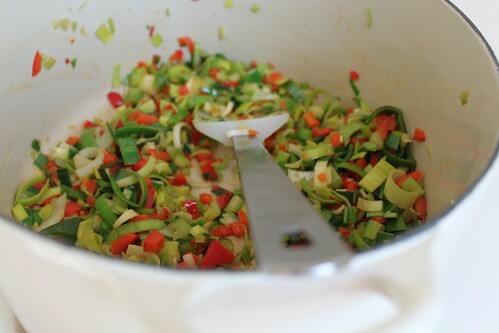 Add the leeks, celery and red pepper and stir until tender (3-4 minutes). Slowly add the flour and milk to the pan, stirring constantly. Once mixed, add the rest of the ingredients (chicken broth, potatoes, corn, salt & pepper). Bring to a boil over medium-high heat. Then cover, reduce heat to low and simmer for 20-25 minutes (or as long as you want – the starch from the potatoes will continue to thicken the soup). Serve by topping with your choice of parsley, scallions, chives, or a mix. If you start taking pictures of the food that you cook at home, it doesn’t take long to realize that a lot of homemade meals are just not that photogenic. Unfortunately, we don’t eat cookies, cupcakes and sushi all the time . But I don’t want to fall into the rut of only posting things that turn out pretty – because, well that would mean I’d be making (and eating) an awful lot of baked goods. Plus, I wanted this blog to be a mix of everything that is good to eat. Hopefully, if my photography skills improve, I’ll be able to make even “un-photogenic” foods look as delicious as they are. But for now, you’ll just have to trust me. This soup doesn’t look like much, but I really love it. This week is “test week”, so I can pretty much assure you that If I get around to posting anything, it will be easy to make. I like to use cooking as a break from sitting, all alone, in the room that John and I like to call “The Dungeon”. But during a really busy week, being away from my books for more than an hour starts to stress me out. So sometimes, I just bring my books with me, to the kitchen, or the gym, or the couch… But seriously, this dinner takes about 15 minutes of prep and packs a lot of flavor. It’s a lot less work than actually stuffing green peppers, but it’s very hearty and will warm you up on a cold winter night. Really it’s not a “soup” in the sense that you could probably eat it with a fork if you’d like, but there was really not another word to use to describe it. In a dutch oven, over medium heat, cook the ground beef for 3-5 minutes, or until brown and crumbly. 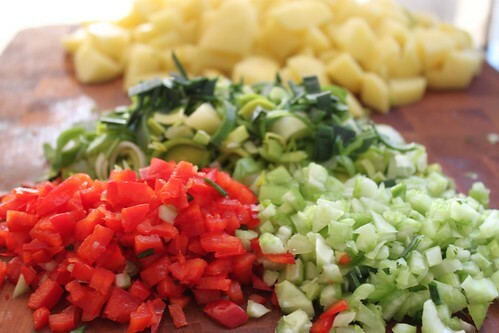 Add the green pepper and chopped onion and cook for about 8 minutes or until slightly softened. Add a dash of crushed red pepper (or more if you like spice) and a pinch of black pepper. Pour in the can of tomatoes, tomato soup and beef broth. Bring to a boil. Reduce heat and simmer, covered, for 45 minutes. Serve over hot white rice.